Dress found for $10 on the clearance rack at Target. Love it! I’m on a girl’s weekend in beautiful Leavenworth, Washington. This little town is built like a Bavarian village. It is so cute-and if you ever get the chance to visit, go for it. It’s going to be 86 degrees today, and we are going to do lots of walking, sightseeing, wine tasting and shopping, so I wanted to wear something very comfy and cool. I chose this print dress from Target. I bought this on the clearance rack for $10, and I think it is perfect for today. 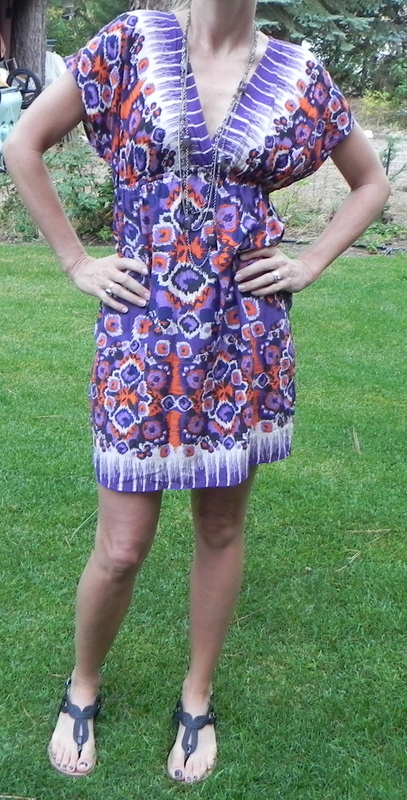 The vibrant print allows it to stand alone- I simply paired it with a cute necklace and sandals. And I’m off… Have a great Saturday! Good outfit for touring the village! Pardon the wheelbarrow in the background- we are definitely in the county!